As of July 2015, the unemployment rate in the United States had dipped below 5.3%, its lowest level since the spring of 2008. That’s great news for workers, who benefit from a tighter labor market in a number of ways. Naturally, it is easier for workers to find a job when unemployment is low. Low unemployment also encourages employers to raise wages, while giving employees extra leverage in salary negotiations. Likewise, a strong jobs market means workers who are unhappy with their job have more freedom to leave and look for something better. In other words, when the labor market is healthy, workers can worry less about merely having a job and think more about their long-term prospects. That can mean planning for retirement, or pursuing a new career that has greater upside. So where in the U.S. do workers have the best career opportunities? Go west… to Utah. Three of the top four best cities for career opportunities are located in the Beehive State. Unemployment in Utah’s major metros is low (less than 4%) while annual jobs growth was between 3.8% and 6.9%. Golden State lacking golden opportunities. Of California’s 26 metro areas, zero rank among the top 25 cities for career opportunities, while five rank among the bottom 25. Santa Rosa is California’s best city for career opportunities, ranking 35th overall. Located in Utah Valley along the Wasatch Front, Provo is a leading center for technology companies and tech development. It is home to the world headquarters of Novell, a software company founded in 1979. It has three “unicorn” tech startups, privately funded businesses that have an estimated valuation of over $1 billion. But the region’s economic successes are not strictly limited to technology. It also has a burgeoning healthcare industry and two major universities in Brigham Young University and Utah Valley University. 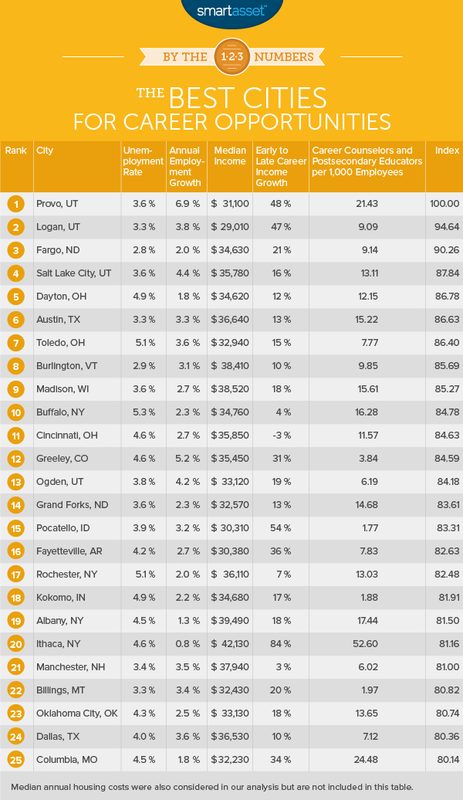 All of that helps explain why the number of jobs in the Provo metro area grew by an incredible 6.9% from 2014 to 2015, the highest rate of job growth of any metro in the U.S. This northern Utah city matches an unemployment rate of just 3.3% with median annual housing costs of $8,244, well below the national average for metro areas. That means workers who are considering jumping to a new job can do so under lower financial stress, with a higher willingness to take a job that has lower pay but a higher potential for advancement. At 2.8%, Fargo has the second lowest metro area unemployment rate of any U.S. metro. The city’s economy has surged in recent years, driven in part by growth in the region’s energy sector but also by strong service sectors such as education and health care. Workers who remain in Fargo for the long term also receive a significant boost, as late-career salaries are 21% higher on average than early-career salaries. Salt Lake City is Utah’s largest city and capital. The metro area population is 1.15 million. 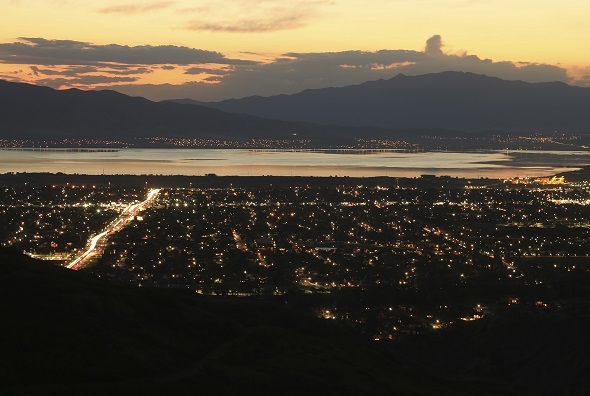 SLC is located at the heart of a larger region running along Utah’s Wasatch Range that includes the top two metros in SmartAsset’s ranking, as well as the 13th ranked metro, Ogden. Combined, these four metros have a population of about 2.5 million and form the best region in the country for career opportunities. Find out if it’s better to rent or buy in Salt Lake City. Salt Lake City added 29,000 jobs from June 2014 to June 2015, a growth rate of 4.4%. That’s the 11th highest rate of employment growth in the country and it means lots of new opportunities, both for those who already live in the region and those who are relocating from elsewhere. As the hometown of the Wright brothers and the location of many of their flight tests, Dayton is known as the Birthplace of Aviation. Today, aerospace and aviation continue to play a leading role in the region’s economy. The National Air and Space Intelligence Center and the Air Force Research Laboratory are both located in the Dayton area. One does not need to be a rocket scientist to build a successful career in Dayton, however. Many of the area’s largest employers are in health care and education. The Texas capital is among the fastest growing metros in the country. Between 2013 and 2014 the city’s population increased by 2.9%, highest among the nation’s 50 largest cities. While there are a number of reasons for this growth, the city’s booming economy is certainly among them. The metro area unemployment rate in Austin is just 3.3% and the number of non-farm jobs in the Austin area increased by 30,000 from 2014 to 2015. That growth is spread across many industries, including tech, renewable energy and life sciences. For many decades, the Toledo economy was tied to a U.S. automotive industry that was in decline. Today, however, it is in the midst of a turnaround. The Toledo metro area has become a hub of research and investment in solar technologies, with companies like First Solar and Xunlight leading the way. Today, the unemployment rate in Toledo is lower than the national average and the metro area added 10,000 jobs from 2014 to 2015. That’s good for a growth rate of 3.6%, which ranks among the top 30 metros in the country. The Burlington metropolitan area is relatively small, with a population of around 210,000. For anyone seeking a small town atmosphere without sacrificing the possibility of a meaningful career, Burlington may be a great choice. The unemployment rate as of June 2015 was just 2.9%. The largest employer in Burlington is the University of Vermont. Other major industries include tourism and manufacturing. As the state capital of Wisconsin and the home to one of the nation’s leading research universities in the University of Wisconsin, Madison has a large number of public sector jobs. Jobs in government tend to have predictable and reliable career paths, especially for those who are willing to seek additional training and education. Workers in Madison are also relatively well-paid. The metro’s median income of $38,520 ranks as the 36th highest of the 355 largest metros in the U.S. While Buffalo was hit especially hard during the recession, it has since recovered strongly, aided by a $1 billion investment from the state government. That investment has attracted such companies as Solar City, which is building a $900 million factory in Buffalo, and IBM, which recently completed an “innovation center” in the Buffalo area. Those expansions contributed to overall strong jobs growth in the Buffalo metro area, where total employment increased by 12,700 from 2014 to 2015. Workers looking to get a fresh start on a limited budget should be able to find an affordable place to live in the Buffalo area, where typical housing costs are just $8,220. To find the best cities for career opportunities, SmartAsset looked at data on employment, income, living costs and professional education in the 355 largest metro areas in the U.S. We wanted to find areas that not only have strong employment markets but where employees can advance their careers by seeking out better jobs or by pursuing further education. We looked at six metrics in all, including the unemployment rate, the rate of employment growth and the median income. We also looked at the median annual housing costs, to control for the cost of living in each city, which also represents the financial risk of leaving a job to seek better opportunities. To reflect the availability of professional education, we looked at the number of educational and vocational counselors as well as the number of postsecondary teachers in each area, controlling for the overall size of the workforce. Lastly, to measure the growth potential in each city, we considered the percentage growth in average income from early-career (age 25-44) to late career (age 45-64). We ranked every metro according to these six factors. We then averaged those rankings, giving half weight to the growth potential metric and the two measures of education (vocational counselors and postsecondary teachers). Finally, we assigned a score from 0 – 100 to each city according to its average ranking. The city with the lowest (best) average ranking scored a 100, while the city with the worst ranking scored a zero. Data on the unemployment rate, the rate of employment growth, median income and the number of vocational counselors and postsecondary teachers comes from the Bureau of Labor Statistics. Data on median annual housing costs and early-career to late-career income growth comes from the U.S. Census Bureau. 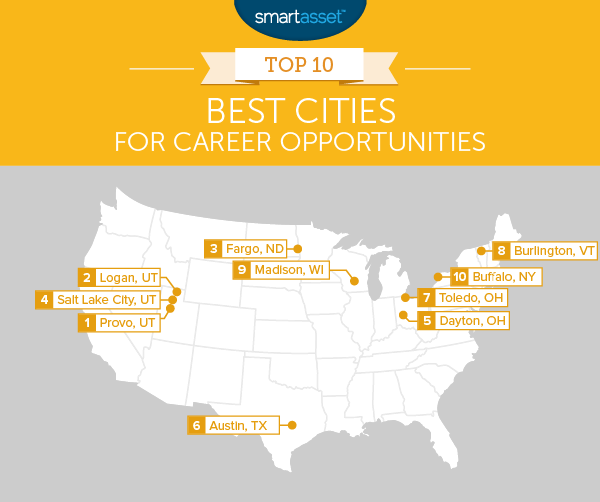 Read the 2016 version of SmartAsset’s study on the best cities for career opportunities.